Teotihuacan—the massive archaeological site nestled in the northeastern part of the Valley of Mexico conjures visions of enormous pyramids and long avenues surrounded by mountains and volcanoes. But there is more to this place than meets the eye. Within and beneath the city’s many plazas, buildings, and monumental structures lie secrets that are only now coming to light. Three pyramids—two impressive examples and a smaller third—anchor the center of the ancient city, which dates to around 100 BCE–550 CE. It is difficult for us, in the 21st century, to imagine the sheer human effort it took to construct these grand architectural statements without the use of working animals or metal tools. At its peak Teotihuacan occupied roughly eight square miles. Archeologists have determined that many groups of people migrated to Teotihuacan around 100 CE, although it is unclear what prompted these relocations. Teotihuacan was the most densely populated city in the ancient Americas, with approximately 100,000 people residing there; it was the cultural, political, economic, and religious center of ancient Mesoamerica. This exhibition examines archaeological discoveries from the three main pyramids, all located along the massive Street of the Dead, as well as from several of the many apartment compounds that housed the city’s population. Why was such a large population attracted to Teotihuacan? A modest temple constructed at the very beginning of Teotihuacan’s history, at around 50 to 100 CE, suggests a powerful religion may have attracted many groups of people from the surrounding areas. Over the centuries, this temple was enlarged and became a massive pyramid, standing over 151 feet tall. Now known as the Moon Pyramid, it is the second-largest monument at Teotihuacan. During one period of the Moon Pyramid’s expansion, around 250 CE, the structure was greatly enlarged, indicating a period of increasing wealth and political centralization in the city. Elaborate buried offerings were made at the dedication of this larger pyramid. Placed in each burial were carefully arranged groups of greenstone and obsidian sculptures, slate, pyrite, and ceramic objects. Human and animal skeletons were also found in many of the Moon Pyramid burials. At the center of each offering were human figures, like those shown here, made from obsidian and greenstone. By examining the materials used to create these figures we can begin to answer some questions about the city. Obsidian is the glass that results from the violent heat and eventual cooling of volcanic lava. It has been used for thousands of years as a cutting tool. In ancient times it was a highly valuable trade commodity. 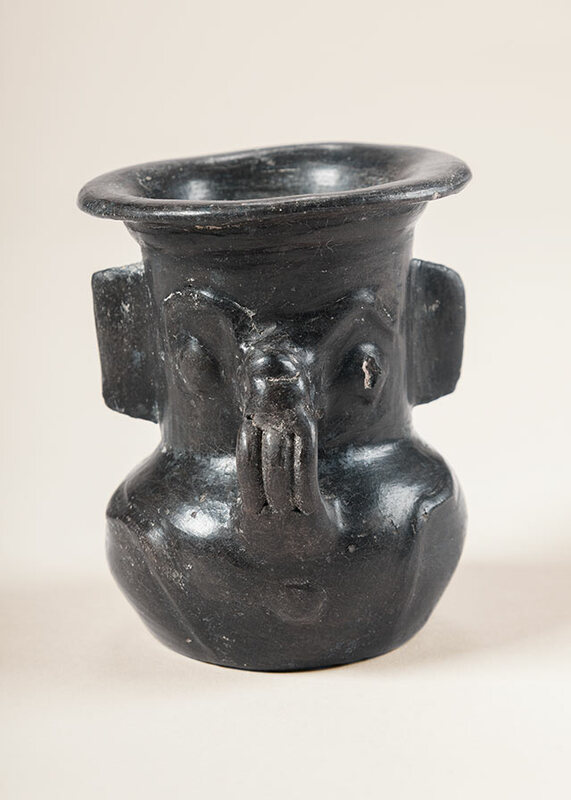 Obsidian played a crucial role in the establishment of the Teotihuacan state. The early city leaders gained control over obsidian deposits in the area and organized work crews to acquire the raw material. They oversaw the artisans who carved it into utilitarian blades and elaborate figures as well at the local and long-distance trade of the material. 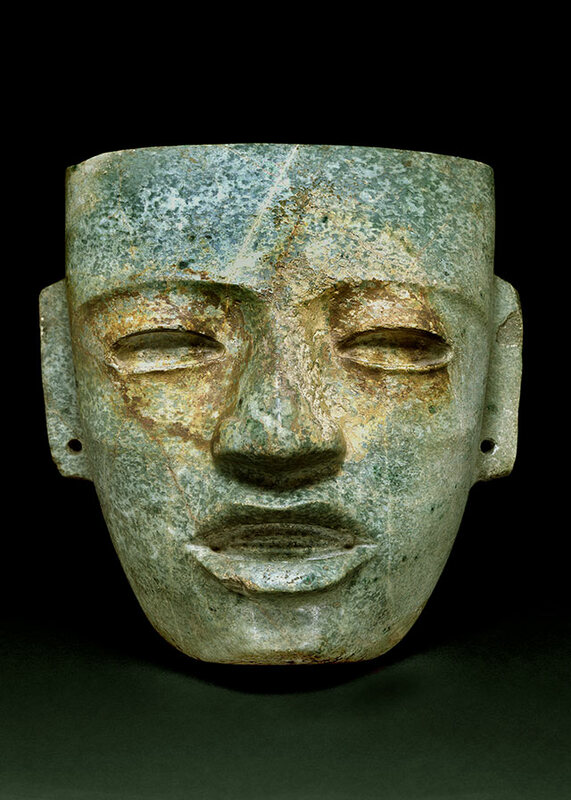 Jade and greenstone were extremely valuable materials for the ancient Teotihuacanos. Many of these precious stones came from afar, imported along Teotihuacan’s vast supply of trade networks. They were prized for their color, which symbolically represented maize and agricultural fertility. The success of the maize crop was crucial to the survival of the city and to the position of its ruling elite. Early Teotihuacanos were able to efficiently farm maize by rerouting water sources and developing complex irrigation systems to produce a supply of food adequate for a large population. The Feathered Serpent Pyramid is the third-largest building in Teotihuacan. It takes its name from the undulating serpents carved into its sides. It is situated in a plaza known as the Ciudadela (“Citadel”), a place for Teotihuacanos to gather and engage in large public rituals. The Feathered Serpent Pyramid is enclosed in the Ciudadela, which consists of fifteen stepped platforms surrounding an enormous sunken plaza. Archaeologists have found evidence that the immense plaza may have been periodically flooded in rituals that turned it into a simulacrum of the primordial sea. The Feathered Serpent Pyramid thus symbolically became the sacred mountain that, in Mesoamerican creation narratives, emerged from the primordial sea to begin time. Time and the ancient Mesoamerican calendar were cyclical and required renewal through ceremony. The Ciudadela may have been the site of massive ceremonies held to appease the gods and also to remind Teotihuacan’s populace of the leaders’ divine right to exercise authority under the auspices of the Feathered Serpent. In 2003, Mexican archaeologists discovered a large tunnel, the length of a football field, running west to east underneath the Ciudadela and the Feathered Serpent Pyramid. This tunnel was made early in Teotihuacan’s history, around 100 CE, before the construction of the pyramid above. A decade of explorations in the tunnel has yielded an astonishing array of objects notable for both their complexity and quantity. Research and interpretation of the site and these finds is ongoing, but it has allowed scholars to establish that the tunnel was manmade and to propose dates for key events. The tunnel was apparently sealed and re-entered on multiple occasions between the time it was first made and its permanent closure (around 250 CE, which coincides with the construction of the Feathered Serpent Pyramid). Evidence supports its interpretation as a representation of the cosmic underworld—a sacred space below ground that connects with our understanding of the ceremonial space above as a site for re-creating narratives on the origin of the universe. In ancient Mesoamerican cosmology, tunnels provide access to the underworld, seen as an aquatic place filled with riches and nourishing seeds; inhabited by deities and creative forces responsible for maintaining order in the universe. Archaeologists found that the walls of the tunnel sparkled; they had been dusted with the reflective mineral pyrite. The dazzling walls recreated the shimmering environs of a cosmic place. 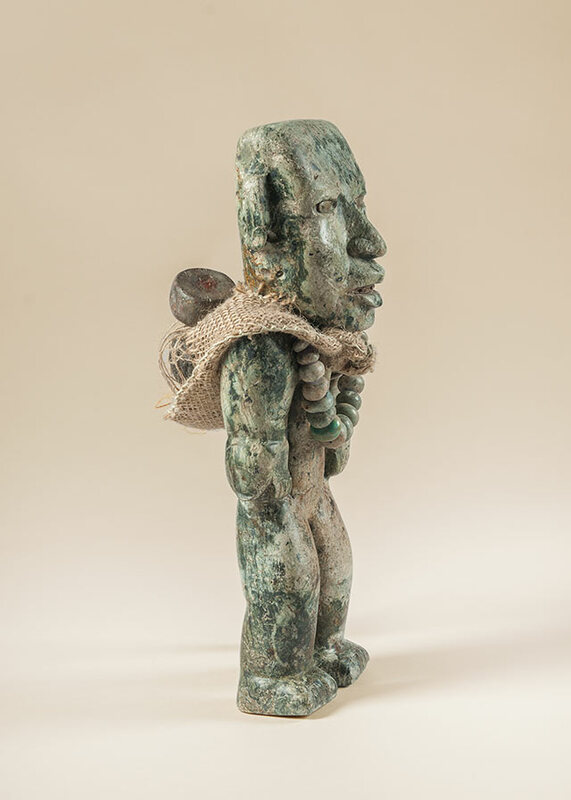 More than 50,000 objects were deposited as offerings in the tunnel; the wealth of offerings attests to the sacred nature of what might be the most important ritual space in Teotihuacan. Near the tunnel’s final chamber, directly beneath the center of the Feathered Serpent Pyramid is an offering believed to mark the axis mundi, a symbolic pillar connecting heaven, earth, and underworld as well as the meeting place of the four compass directions. This offering contained four enigmatic sculptures, some apparently carrying bags of greenstone objects and iron-ore mirrors and discs, suggesting a deeper, more ritual significance. 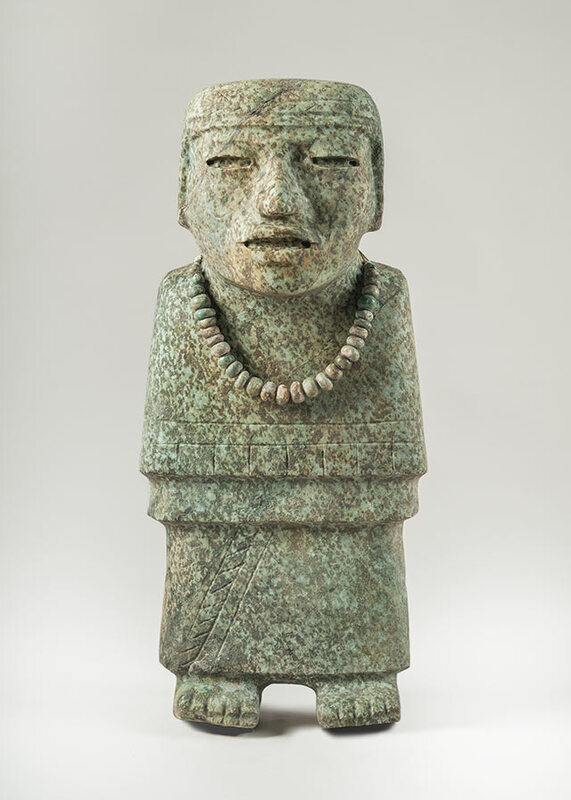 They may represent Teotihuacan’s founding ancestors, witnesses to the birth of time. If you’re looking at a human figure and its eyes are open ... the eyes have traces of other inlaid materials ... to represent the pupil and iris.... These objects are very much thought to be alive, and not just imagined to be alive, made to be alive by the addition of these other materials. The size of the Feathered Serpent Pyramid is not extraordinary in comparison to the Sun and Moon Pyramids, but all four sides were covered in luxurious and monumental carvings that represent the highest expenditure of energy among all of the sculptural programs in Teotihuacan, signifying the structure’s importance. The facade depicts undulating serpents with heads that are surrounded by wreaths of feathers. The serpents’ bodies support facelike elements that appear to be headdresses, with nose pendants carved under the upper jaw. These images may represent a primordial crocodile, a symbol that was later used by the Aztecs as a calendar sign to mark the beginning of a new era. Approximately 100 years after it was built, the western facade of the Feathered Serpent Pyramid was covered over by an additional construction and the sculptures on the other three sides of the pyramid were deliberately damaged or removed. Scholars are still unsure as to what political event led to this destruction. These two carvings from the façade were found on different sides of the pyramid’s base. 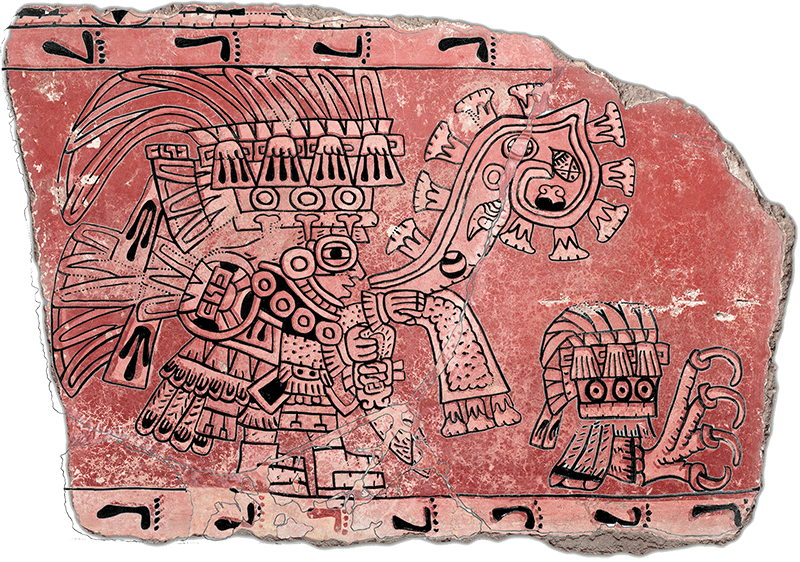 The entire facade of the Feathered Serpent Pyramid was originally colored with green and red pigment and may have resembled this mural of a feathered serpent from an apartment compound near the ceremonial center of the city. This mural represents a similar plumed snake that embodied the union of earth and sky. Notice the water emerging from the serpent’s mouth that seems to nourish the plants below. The murals of Teotihuacan decorated many of the city’s apartments and administrative centers; they reiterated the dominant ideology of the city. The red backgrounds on most murals place them in cosmic time and the sacred world. Sparkling minerals, hematite and pyrite, were mixed into the paint which was placed directly on a wet surface of stucco and then burnished, creating a durable surface that can last for centuries. These shiny surfaces would have been activated by light reflected from shallow pools in the compounds’ central patios. In this way the murals, like the sparkling tunnel buried beneath the Feathered Serpent Pyramid, recreated the physical environment of supernatural realms. The Sun Pyramid dominates the center of the city. It is Teotihuacan’s most massive monument, and one of the largest ever built in the ancient world. The structure was built in one single, massive effort around 200 CE. Its square plan covers roughly 60,000 square yards, and it rises 200 feet high, making it one of the tallest buildings in the Western Hemisphere until the advent of the modern skyscraper. The figure is burdened with a brazier atop his head. Burn marks indicate that it was most likely used for ceremonial incense burning. Communal ceremonies played a large role in binding the citizenry together. 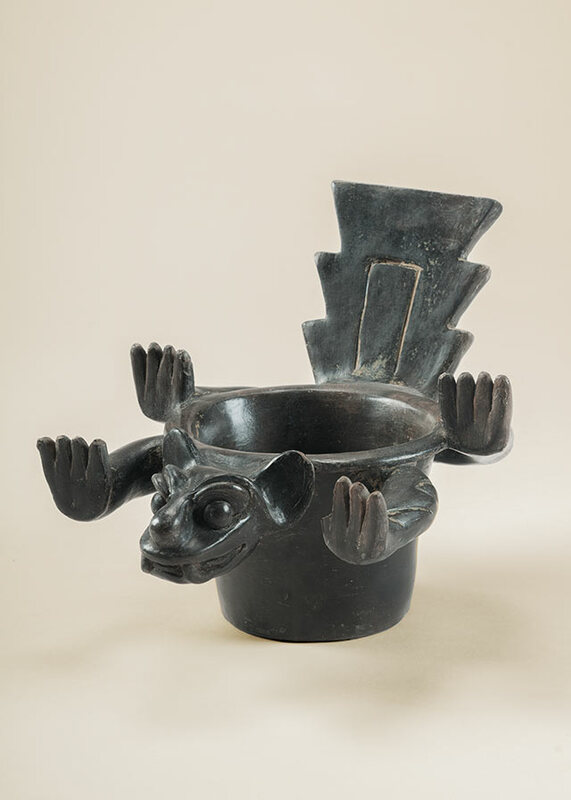 The Old Fire God is usually represented in volcanic stone, suggesting a specific connection between the deity and the smoldering volcanoes surrounding the Valley of Mexico. 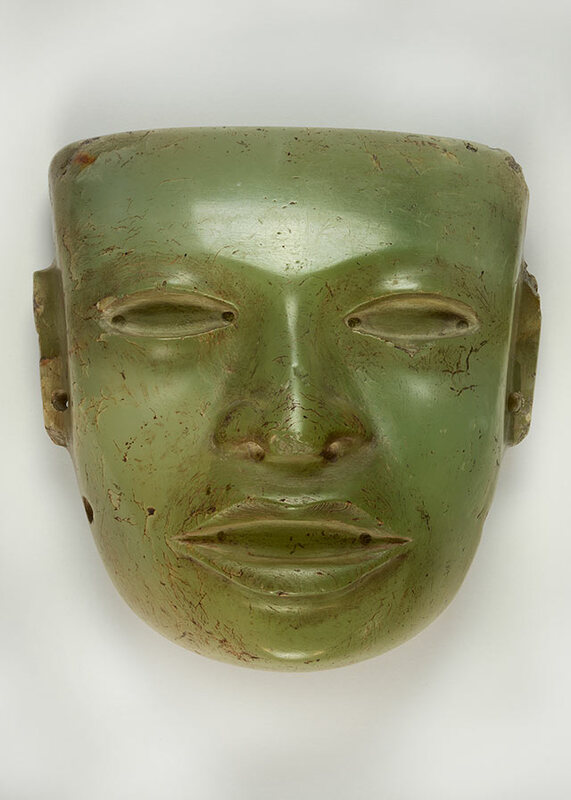 The old man wears rounded earflares, probably representing an association with the precious materials these accessories were usually made from, jade or greenstone, and indicating his links to the elite. Archaeologists believe that the Sun Pyramid supported a temple on its summit, which housed this large stone carving of an elderly, cross-legged figure with a brazier atop his head. This represents the Old Fire God. Fire was an essential force that both powered and threatened the city; it required careful management. 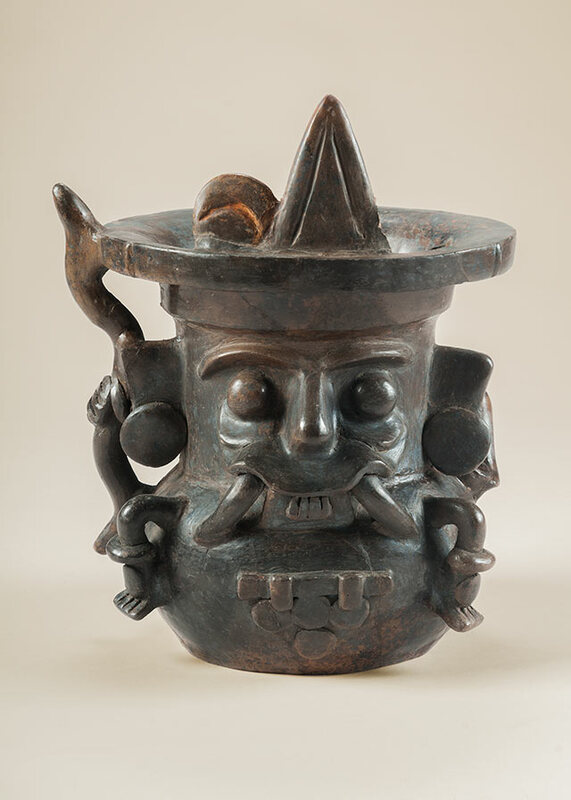 The art of Teotihuacan represents manifestations of natural forces and the beings and rituals designed to keep these elements in cosmic balance. The Old Fire God also played an important role in unifying the city. 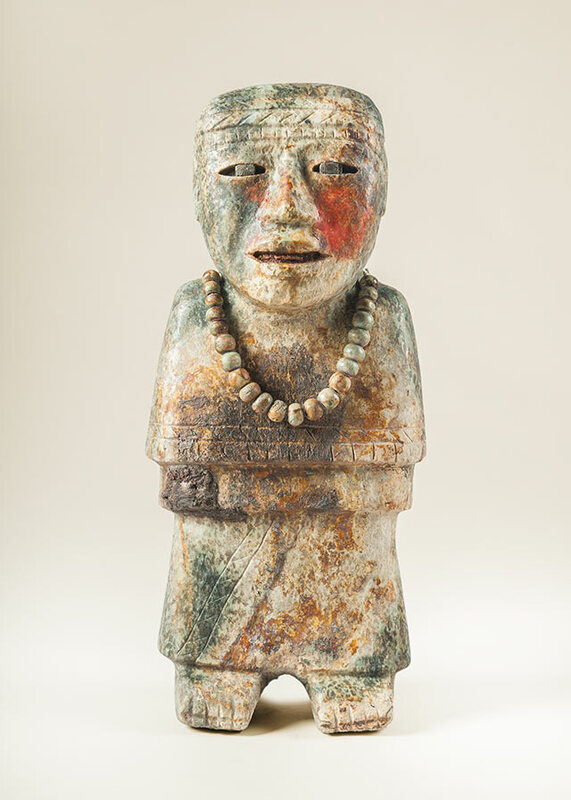 Earlier versions of this deity appeared in central and western Mexico and Oaxaca in advance of Teotihuacan’s rise. With the rapid influx of people from these areas early in the city’s history, and with the challenge of unifying such diverse populations, city leaders appear to have taken advantage of this deity-in-common, the Old Fire God. Teotihuacano modifications of the earlier traditions helped to bind the many different ethnic groups together. More than 100 Old Fire God figures have been found throughout the city, in locations reflecting both high and low status of its residents. He's almost always in stone, almost always in this kind of compact form, and he represents an old man. You can see the sunken, wrinkled cheeks, kind of protruding jaw with the teeth, and hunched over body. Other deities in Teotihuacan include the Storm God and the Maize God. The Teotihuacan Storm God is identified by arching eyebrows or goggled eyes, a curved upper lip, and aggressive fangs. This Storm God also holds a lightning scepter in his right hand, referencing fire and violent storms. Teotihuacan is located in a relatively dry region that gets little rainfall outside of the rainy season that lasts from June to October. Agricultural land was created and maintained by modifying and diverting the natural springs and rivers that ran through the city. Still, agricultural productivity relied on favorable weather and therefore on appeasing the Storm God. Many ceramic vessels depicting the Storm God have been found at Teotihuacan, as well as images on murals of elite figures dressed as Storm God impersonators. Images of maize gods are familiar among most ancient Mesoamerican cultures but have been curiously absent from Teotihuacan. 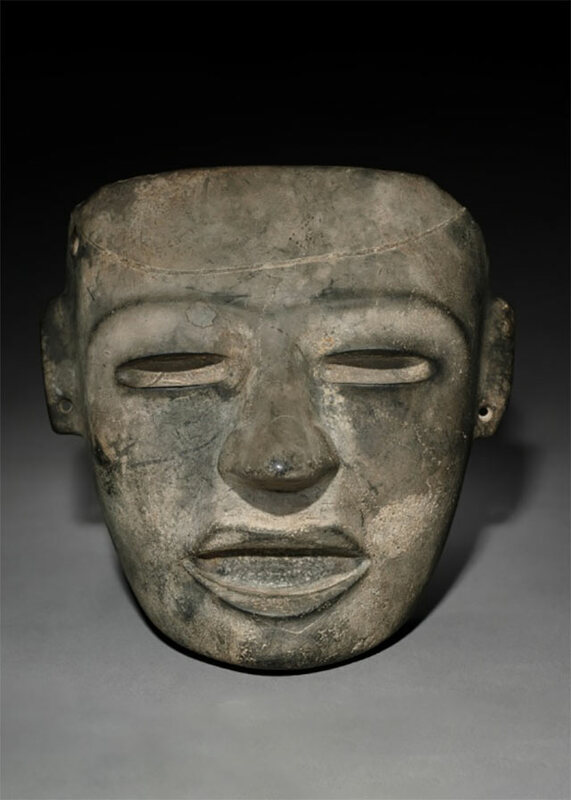 New research suggests that the many enigmatic stone masks found around Teotihuacan depicting an idealized man’s face may, in fact, represent the Maize God. This would accord with the deity’s depiction throughout much of Mesoamerica as a physically pristine youthful male. Many stone faces have been found along the Street of the Dead, indicating their importance to elite ritual, but their exact use is unknown. More than 500 similar masks have been identified to date, approximately three dozen of which have archaeological contexts within the city itself. Outside of the ceremonial core, a large portion of Teotihuacan consisted of architecturally similar apartment complexes that were built in a gridlike layout. These apartments were occupied by extended family groups often specializing in specific craft production—obsidian or ceramics, for example. Although we do not know the dominant language spoken by Teotihuacanos, we do know that the city was home to a variety of ethnic groups from different parts of Mesoamerica who spoke multiple languages; some resided in ethnic enclaves, where they carried out some of the cultural practices of their homelands. You could see in the teeth the isotopic mark of the place of origin of the person, because the enamel of the teeth blocks any change in that isotopic rate. So you have altitude and geology to know the region from which they came from. So when you compare the molar with the femur, you have the place of origin and the place of death. It is estimated that there were around 2,000 apartment compounds throughout Teotihuacan, ranging in physical size and level of decoration. In many cases the walls of these apartments were decorated with elaborate mural paintings. The murals have survived the centuries because they were painted directly into the plaster covering the walls when it was still wet, creating an extremely durable surface. But as the upper walls crumbled, only the paintings on the lower registers survived, leaving us with only a glimpse of what they once were. The most elaborate murals were limited to the administrative centers and the apartments of the upper and middle classes. This mural comes from a compound of wealthy residents, and we can assume that the richly dressed figure in profile represents an elite member of Teotihuacan society. Archaeologists and art historians hypothesize that these elite figures played crucial leadership roles. Decoding the events depicted on these intricate murals requires close looking and patient viewing. Many Teotihuacano elites are shown wearing headdresses that are topped with long feathers; although these are depicted in red, they represent the green feathers of the tropical bird called the quetzal. These feathers were valued for their iridescent, shiny green color and for their rarity; imported from the Maya regions of southern Mexico and Guatemala, nearly 600 miles away, they are emblematic of Teotihuacan’s far-reaching diplomatic and trade relationships. The headdress also contains tassels, projectile points, and round ornaments. These headdresses may have belonged to high-ranking individuals involved with diplomatic, military, and trade contacts in other parts of Mesoamerica. This speech scroll is probably an allusion to agricultural fertility, or to a “flowery” kind of speech. The right hand holds an incense pouch. Archaeologists believe that burning incense played an important role in the city, and many elaborate incensarios (incense burners) have been found there. A stream that concludes in flowers flows from the left hand. It is likely a reference to the role of the elite in ensuring agricultural fertility. 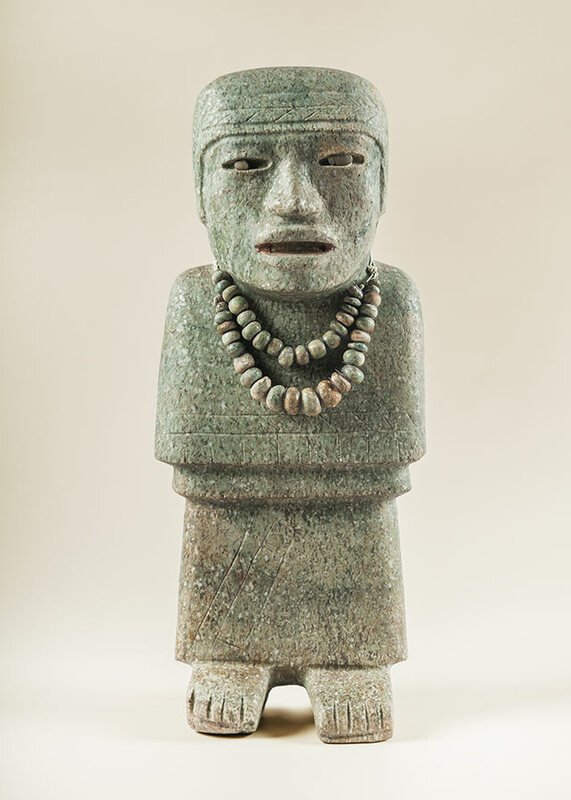 The figure wears jade or greenstone earflares. Like the green feathers, these would have been precious, exotic objects. Throughout history, elites have worn luxury items as a visual display of their high status. The round rim surrounding the figure’s eye perhaps depicts an object made of shell; it is most likely a reference to the Storm God and his characteristic goggled eyes. The elite figure marches on a band of footprints that most likely refers to the act of walking in individual and community processions, highlighting the importance of ritual. This figure is one of many from the same set of murals, all walking to the right as they make ceremonial offerings. This glyphlike object is wearing a Tassel Headdress, including Storm God goggles and flames. A form of picture writing with glyphs that seem to represent things or places appears at Teotihuacan, but whether or not it represents a spoken language is still debated by scholars. 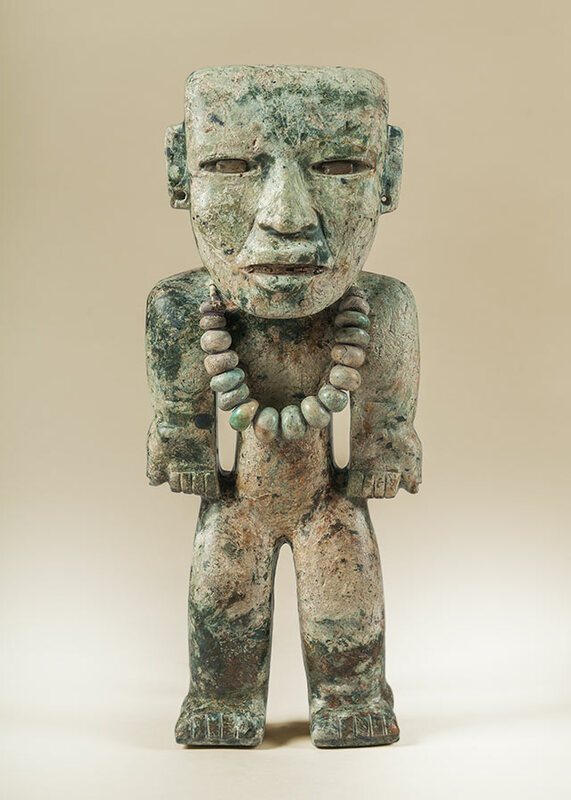 Several sculptures from Teotihuacan, including this marble figure, exhibit evidence of violent destruction relating to a great fire that marked the city’s demise. Around 550 CE, the ceremonial center was burned and ritual objects were intentionally smashed and scattered in acts meant to divest them of their ritual power. Teotihuacan’s demise may have resulted from environmental difficulties or from political unrest and societal tensions rooted in the migrations into the Valley of Mexico. Whatever the cause, the systems of urban and religious maintenance devised by the Teotihuacan rulers that had succeeded for over 400 years fell apart, and Teotihuacan’s regional dominance ended. We found this sculpture, but shattered in more than 80 pieces. There is no hint of any invasion of foreign people towards the site. But what we see is that all of the scenarios of the ruling elite were burnt and destroyed. To the Aztecs, who came to prominence almost 900 years after the fall of Teotihuacan, the ancient city was considered the place where the gods brought the world into existence. They gave it the name we use today, also naming the Sun and Moon Pyramids and the Street of the Dead. The city’s monuments have been central to Mexican national identity ever since the beginnings of archaeology in the late 19th century. As an ancient ruin, Teotihuacan is one of the most visited archaeological sites in the world, welcoming millions of visitors a year. As it did in antiquity, Teotihuacan’s scale and planning continue to inspire awe in modern visitors and scholars. It is simultaneously a place that a modern city-dweller would instantly recognize as an urban environment and a place that reflects the intentions of its creators to build a mirror of the cosmos. I would encourage people to think of cities as a far more complex organism than just the physical things that we can uncover. What makes cities run are people. If you think about the incredibleness of so many people living in close proximity with each other, I think cities are our most incredible invention as far as the human species. Though the state of Teotihuacan collapsed nearly 1,500 years ago, the legacy of the ancient city is still alive today. In San Francisco’s Mission District, images of the Feathered Serpent twist and turn over storefronts and throughout alleyways. In Teotihuacan, the symbol of the Feathered Serpent was part of an iconography reflecting a common culture and belief system that united diverse populations and contributed to a shared urban identity. The tradition continues: the art of Teotihuacan, now a symbol of Mesoamerican history and culture, contributes to the multiculturalism that San Francisco celebrates. 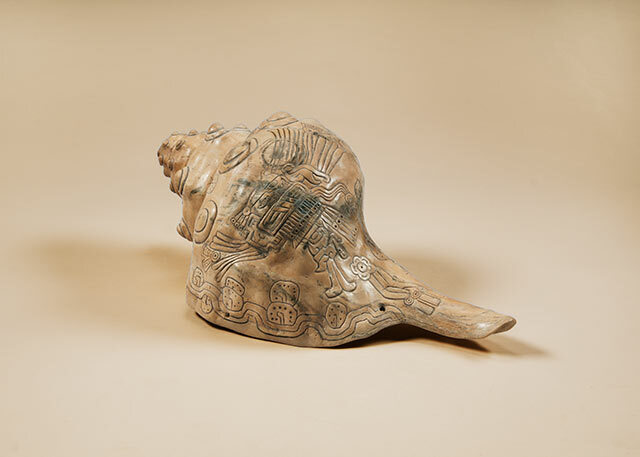 Monumental and ritual objects from Teotihuacan’s three pyramids will be shown alongside mural paintings, ceramics, and stone sculptures. Hear from curators and site archaeologists on the exhibition audio tour. Discover more fun facts and share your thoughts about the exhibition.